Because this is usually how I use Sample Room!!! I always sort the samples by availability, and I view a lot at once already. I personally don't like relying on the front pages as these usually will focus on the newest entrants to the sample cabinet. Like the brands who just joined, or the new products that have just been added to the list. Just like all the other citizens of the Philippines, I have also experienced not getting hold of an especially popular sample, and sometimes, I may forget. I usually like to check the cabinet as a whole such that when there is a silent restock of a sample that I really want, I can find out about it. I also like checking the cabinet because there are times that there are too many new additions that not all the new additions get the airtime immediately all at the same time. 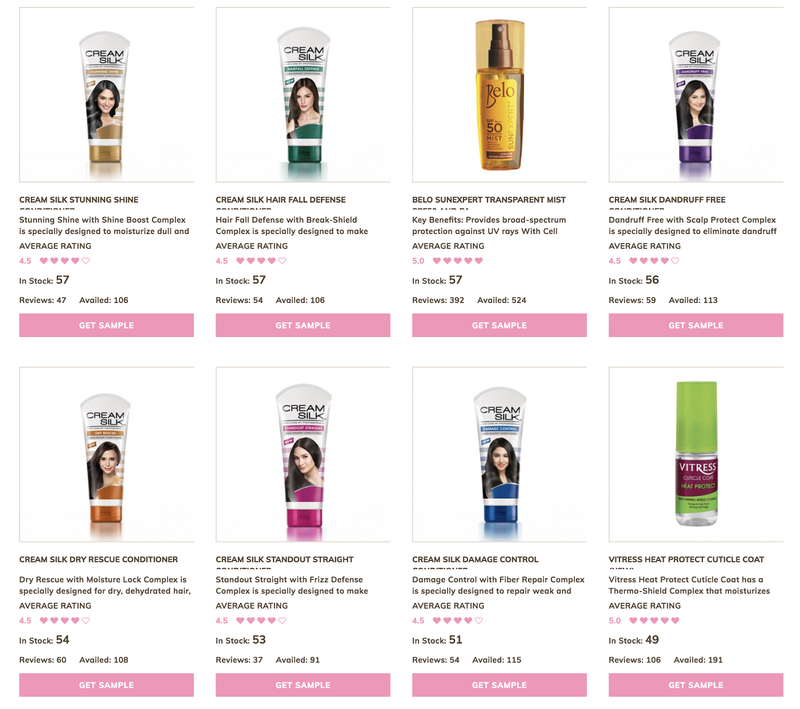 I sometimes go to the site and see a dozen new available product types all of a sudden! If you're not that obsessed that you can rely on social media alone, then that's OK. But if you, like me, want the news straight from the source, look at the sample cabinet immediately! Belo Baby Talc Free Powder: It's not as fine milled as other powders, but what I like is that this smells reaaaally good, and serves a good job against sweat and oil. I personally use this as a face powder when it's the middle of the day and my face is already so oily. I personally am not particular about talc presence in my powders, but if you don't like talc, this is for you. Belo SunExpert Body Shield SPF60: Belo's body sunscreens are very lightweight in general, this being no exception. I find this to be less sticky than competitors, too. Although for water sports, this may not stay put as long as competitors. 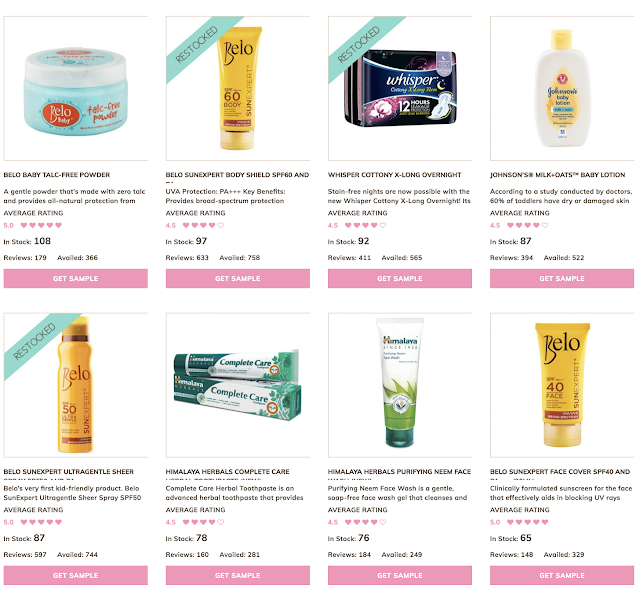 I primarily use Belo Sun as my everyday sunscreen. I love how this feels comfortable enough to use everyday. I actually also did hear Cristalle explain that her mom would chastise people for not using sunscreen, despite not religiously using it either. They saw that the gap in the market was that most sunscreens for sale are too heavy and sticky to be realistically used everyday in this weather. That's why they decided to create their own range of sunscreens that can be comfortably used everyday in this climate. Whisper Cottony X Long Overnight: I personally love Whisper. That's all. I've been on Whisper for at least a decade now. Get yourselves some Whisper. Johnson's Milk+Oats Baby Lotion: I love everything Johnson's, but for those who are looking for a variant that provides a high level of moisturization, this is the best variant. The Milk + Rice variant is also hydrating, but the Milk + Oats one reaally is just more hydrating for some reason. Himalaya Herbals Purifying Neem Face: For those who are looking for facial washes that are effective in oil control without making skin feel dehydrated (like squeaky clean but in a bad way), this is a good choice. Overall, Himalaya Herbals is a very good go-to brand for anybody living in tropical climates. Belo SunExpert Face Cover SPF40: I find myself using this almost everyday as well. This feels lightweight, and has a slightly powdery velvet finish. I still am looking for a foundation that is compatible with this though. A lot of the newer generation foundations have no SPF, so I find myself still needing to use sunscreen before foundation. Cream Silk Hair Fall Defense: This smells reaaally good! And the fragrance somehow lasts the longest as well, amongst all Cream Silk variants. Belo SunExpert Transparent Mist: This is a good product for those who do not like the feel of lotions. However, it essentially is like a dry oil, so if you personally do not like oily products, this may not work for you. Personally, I do like it a lot for water sports because the dry oil format means it doesn't rub off easily. Cream Silk Dry Rescue: Since I got into hair coloring so much, and like right now I still am growing out bleached hair from a bleach job almost 2 years ago, this has become my favorite variant. I was an intern for Cream Silk (yes I have to say it again) in 2015, and what I really learned while working for the brand is that the formulation really is for Pinays and for the Philippine climate. This is why this is magically so nourishing despite not making hair oily or heavy. Cream Silk Standout Straight: I'm sure y'all have tried this by now. I've used up at least 10 of these in the last 3 years alone wahahaha. Cream Silk Damage Control: I use this alongside Dry Rescue a lot these days. Between this and Dry Rescue, I don't really see a difference in effects. But generally these two variants are more frizz controlling than the others. As for me, I only recently colored my hair black (basically I dyed it back to my natural hair color so I could get out of the vicious cycle of recoloring and recoloring), so my hair right now still essentially is dye abused hair. I see myself needing a lot of this variant, as well as Cream Silk's DTC range overall, for the next year and a half or so. Talking about all these new stocks, I also learned something new from Sample Room! For those who are looking for an anti dandruff hair range that's herbal, Moringa-O2 has their range! 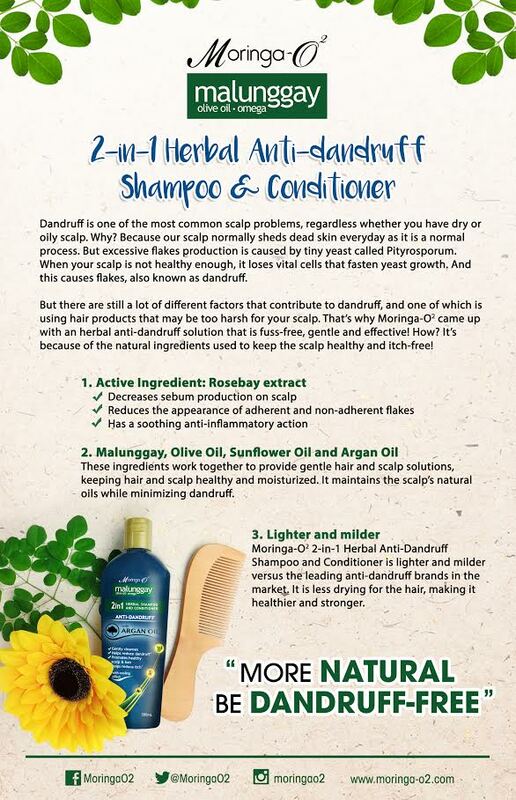 It has malunggay, sunflower, and argan oils. It also has rosebay extract. I find this unique because most anti-dandruff shampoos are more clinical in nature and are chock full of clinical ingredients. If you're finding that your usual anti dandruff shampoo is not working for you, or you might find them too harsh, then this is a good choice. If you're suffering from backne from your current anti dandruff shampoo, then this might be an option for you as well. This retails in 2 sizes: 200 ml (Php199.75)/ 75ml (Php99.75), and is available in all leading supermarkets and department stores nationwide. Moringa O2 is now also retailing in Nigeria! Who knew? 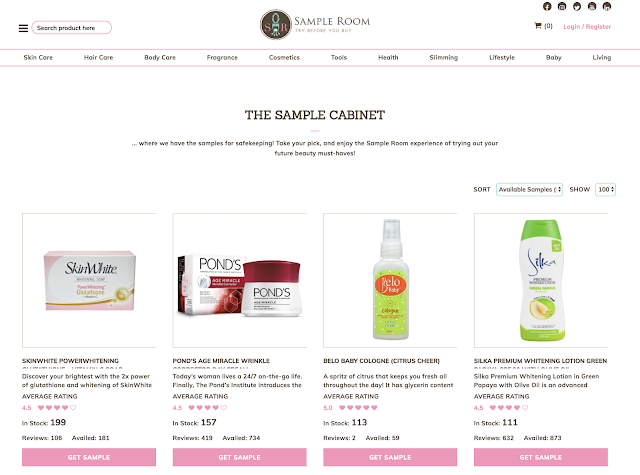 For now, be sure to check out Sample Room's sample cabinet and try something today!